Louise Minchin had no idea that a fun physical competition on BBC Breakfast would change her life. In an Olympic-inspired contest back in 2012, the BBC Breakfast presenters were challenged to a cycling competition around the velodrome at the National Cycling Centre in Manchester. It was here that Minchin discovered her competitive edge. When a friend suggested she might enjoy triathlon, Minchin signed herself up and hasn't looked back. 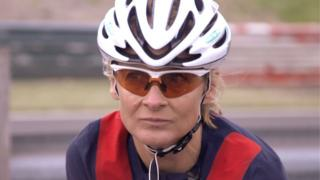 This week, the 46-year-old BBC presenter will compete for Britain in her age group at the ITU World Championships in Chicago. "I didn't even know what triathlon was before 2012," she says. "You can do triathlon at any level...one of the most fun things is doing it as a relay with some friends." Get Inspired caught up with Minchin in Loughborough where she met up with some members of the GB Para-triathlon team to pick up some training tips. Has Louise Minchin inspired you to give triathlon a go? Visit our dedicated guide for information and tips on how to get into the activity. Ready to take on the same course as the professionals? Sign up for the World Triathlon in Leeds in June 2016.